Pictured are the speaker for the evening, John Porter, and scholarship recipients Debbie Clemmons representing Joci Taylor, and Brittany Manning. 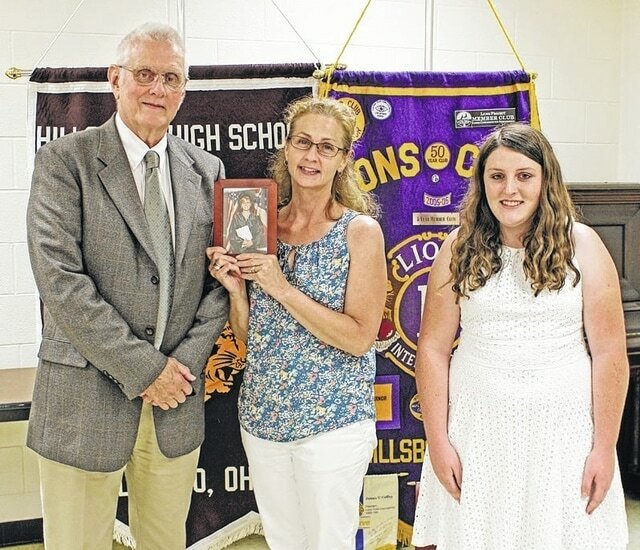 Retired history professor from Southern State John Porter was the speaker for the evening at a recent Hillsboro Lions Club meeting where the club’s 2015 scholarships recipients were recognized. Porter challenged students to be true to their upbringing and their home-taught values while away from home. While away they will meet students from a wide variety of cultural backgrounds with an equally wide variety of religious and social beliefs. He also stressed the value of service to others, and the personal fulfillment that helping others brings to one’s self. Porter also stressed the value of an education. Scholarship recipient Joci Taylor was unable to attend the meeting. She was out of town with family. She is represented by her grandmother, Debbie Clemons. Brittany Manning II graduated from Hillsboro High School. She took honors level courses at HHS and Post Secondary classes at Southern State. Manning tutored students during the day in math and science. She also participated in the community seminar program where she helped elementary students with their learning. Her goal is to be, “the best teacher she can be, and leave her students with an interest in learning”. Maning will attend The Ohio State University majoring in early childhood education. Submitted by David Lowell, Hillsboro Lions Club president.